Fortunately, Joni’s latest report was good. After a couple of days off with icing and ibuprofen, and despite some continued pain, Joni had started short runs again, testing it out and monitoring the results. After several days of experimenting in this way, she had been able to better isolate the pain, and had noted some patterns of when it did and didn’t hurt. That had led to more effective icing, etc., and finally, that morning, she had been able to run ~4 miles completely pain-free. On the show, Hugh Laurie plays the brilliant but caustic Dr. House. Although he heaps verbal abuse on his patients and his colleagues (perhaps because he lives with a painful, permanent injury himself), he also excels at identifying the mysterious ailments that baffle the conventional medical minds around him. One of House’s favorite techniques is to bombard his patients with treatments that aren’t necessarily designed to solve the problem, but rather to force the body to show its cards, so to speak, and to reveal what’s really going on. But in my experience, almost every serious runner keeps running through a lot of minor and some major hurts. Stubbornness? Yes, but not only that. In addition to not wanting to miss the daily run, the injured runner has another compelling need, that is, to get better information about the injury: What hurts? When does it hurt? What makes it hurt? Is the hurt getting worse or better or staying the same? Some injuries present clear and classic symptoms, making diagnosis easy. But many injuries present inconclusive symptoms, or they masquerade as something else: the “hamstring pull” that turns out to be a hip flexor issue; the “IT band inflammation” that turns out to be bursitis; the “plantar fasciitis” that turns out to be a bone chip in the heel; the calf muscle strain that turns out to be deep vein thrombosis. Oh yes, there is plenty of material here to supply several seasons of a medical melodrama. And because few of us know real-life versions of the Hugh Laurie character, we act as our own Doctor House, trying stuff — experimenting on ourselves — to see what will happen. Can this approach work? It seems at least a little unwise, but sometimes it does work. By running a little, by exposing the body to some of the stress that got it hurt in the first place, the patient — I mean, of course, the runner — begins to figure out the injury, its extent and severity, and maybe even what to do and what not to do to coax the injured part back to health. There are risks, surely. One of the biggest risks is that patient in us is in a state of denial (this is usually the case for Dr. House’s patients, too). It’s tough to be objective when you are the object under consideration. Or, as Richard Feynman put it, “The most important thing is not to fool yourself. Unfortunately, you are the easiest person to fool.” Why? Because you, of all people, want things to come out a particular way. Hugh Laurie’s character understands that his patients are often part of the problem, and that’s why he tends to ignore what they say (“Everyone lies”) and instead focuses his attention on what happens to their bodies with each new treatment. I wonder whether we’re capable of reaching that state of detachment that enables us to focus on the experiment without having too much invested in the results. I’m sure that real doctors (Robin, are you out there reading this?) cringe when people like me bring up this fictional doctor. I’m sure that real medicine doesn’t look anything like the fictionalized version in the popular show. My point is not that House represents reality, but rather that House represents a longing for insight and knowledge in a confusing world full of unexplained pathologies. 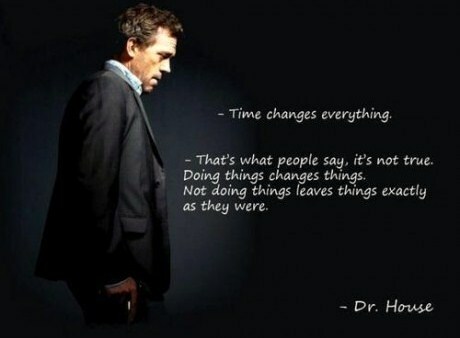 Can runners learn from House? Yes, but only if we are really committed to learning, rather than simply looking for reassurance. This entry was posted in Injuries & Health, Uncategorized. Bookmark the permalink.